Do you know what Jigsaw-Dat Ransomware is? Jigsaw-Dat Ransomware is not exactly a new ransomware infection, as research has shown. Specialists say that this threat is a new version of Jigsaw Ransomware. In fact, it is almost identical to this threat. This means that this infection will mercilessly lock your files too if it ever slithers onto your computer. Malicious software developers know well that it is not that hard to extract money from users – they will agree to transfer money to them if they find their personal files encrypted. Do not be one of those users who decide to make a payment. There is nothing smart about this because cyber criminals might make up their minds and do not give you the tool that can unlock files. You could not do anything to change this or get your money back in this case. Therefore, our recommendation for you would be to delete Jigsaw-Dat Ransomware fully for the system to prevent more files locked and then, if possible, restore files from a backup. Only those users who have backed up those encrypted files at least once could retrieve them. This once again shows how important it is to back up files regularly. Jigsaw-Dat Ransomware should not affect many users if it does not become a prevalent infection one day because it does not seem that cyber criminals distribute it actively right now. Despite the fact that this is a new infection, it should not differ from other crypto-threats regarding the distribution methods. That is, it should also be spread via email attachments. The malicious attachment might not look harmful at all, so you should closely inspect any file sent to you via email. For example, you can scan it with an antimalware/antivirus tool before opening it. People also often end up with harmful threats if they keep downloading software from websites that are completely unreliable. Keep in mind that it is also quite risky to click on random links. Remove Jigsaw-Dat Ransomware right away even if all your personal files stored on the computer have been encrypted. Do not keep it active – you might soon find more files encrypted. Do not expect to disable this threat by restarting your computer. It creates a point of execution in the system registry, so it will continue working on your system after the reboot. You will only disable it by erasing all its components. Locate malicious processes (firefox.exe and drpbx.exe) and kill them. Remove files: %APPDATA%\Frfx\firefox.exe and %LOCALAPPDATA%\Drpbx\drpbx.exe. Right-click on the firefox.exe value and click Delete. 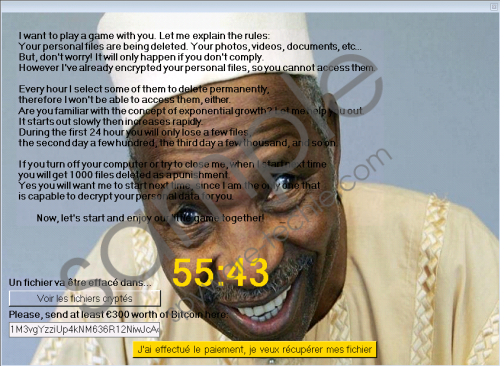 Jigsaw-Dat Ransomware is a malicious application that will cause you serious problems. To be more specific, your all files will be encrypted if this infection affects your computer. It targets the most valuable files, from documents to music. Then, it demands a ransom. It may seem like the only way to get files back, but it is not exactly true. If you have copies of your files, it will not be a problem to restore them. Of course, you must remove the ransomware infection first. Tags: delete Jigsaw-Dat Ransomware, Jigsaw-Dat Ransomware, remove Jigsaw-Dat Ransomware.